Bursitis is a common condition that occurs when a bursa becomes irritated and inflamed - this is typically due to repetitive movements with high friction on the bursa sac or through a sharp blow to the bursa (acute trauma). If you are suffering from bursitis in your foot, you are well aware that something is very wrong, as there will be a lot of pain and discomfort with every step you take. Although there is only a small number of bursae that occur naturally in the foot, the body creates more bursae in areas where pressure and friction of great. As we walk, run or jump, the ground surface and the shoes we wear play an important role in how much trauma our feet experience. Every step can cause a small amount of damage to a particular area in the foot which can increase the risk of bursitis. Since the feet take such a tremendous load as we go about our daily tasks, there are several points in the foot that can develop bursitis due to added pressure and rubbing. As we stated earlier, the main bursae in the foot that become affected by bursitis include the metatarsal bursa, the metatarsophalangeal bursa, and the calcaneal bursa - BUT - other bursae can and will develop (and possibly become inflamed) where the foot requires excess cushioning. There are a myriad of interesting characteristics of the human body that are not well known, and the fact that the body will grow a bursa wherever it is needed is certainly one of them. Perhaps someone that frequently wears high heeled shoes over a long period of time will have bursae in areas that others do not. Another example would be someone that walks with an abnormal gait - over time bursa sacs may develop in areas where they do not develop in someone with a uniform gait. 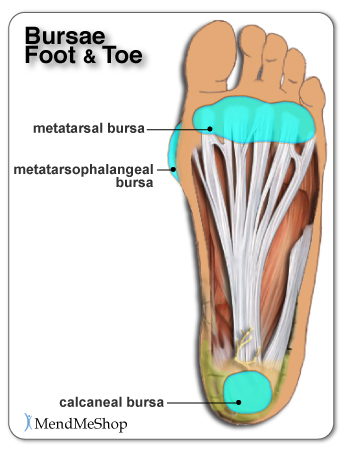 The metatarsal bursa is located at the base of the toes on the bottom of the foot. This bursa can be irritated when one metatarsal bone takes more load than the others. When this happens, the soft tissue between the bone and the skin becomes compressed and inflammation in the bursa can begin. Walking barefoot on a hardwood or tiled floor without cushioning will increase pain noticeably due to the direct pressure on the metatarsal bursa. Bursitis can occur on the top of the toes as well. Those suffering from conditions like hammertoe often develop bursitis as a secondary condition. An abnormal toe joint can cause excessive rubbing against shoes. The constant rubbing will make the toe tender, swollen and red as bursitis sets in. Wearing shoes is painful and even the pressure from wearing socks can cause pain and discomfort. Intermetatarsal bursitis occurs when the tiny bursa between the toes (metatarsals) become compressed. Tight and narrow shoes can be the cause, however, it can occur naturally as we age and the arches in our feet begin to flatten. As the arches fall, the metatarsals put more pressure on the bursae that separate the toes. In this situation, swelling is rare but the pain usually travels right up to the toes. 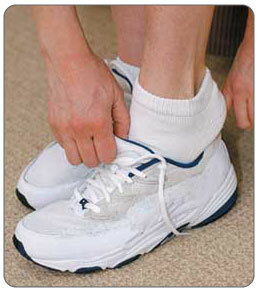 Wearing wider shoes and supports in your shoes can decrease the pressure on the bursae and help to alleviate pain. The metatarsophalangeal bursa is located on the inner part of the foot near the big toe. This bursa is a common spot for bursitis to develop as it is where a bunion (enlarged metatarsal bone) causes excess rubbing. Naturally, a bursa by a bunion can become inflamed with the excess friction in the area. Patients suffering from bursitis in the metatarsophalangeal bursa often have difficulties finding shoes that do not exacerbate the pain and sometimes resort to open shoes that do not cover the painful bursa. At the bottom back of the heel lies the calcaneal bursa. Bursitis is common in this bursa due to the thinning of the fat pad in the heel over time. The micro-trauma the heel undergoes with every step eventually becomes too much and the bursa becomes inflamed. This type of bursitis can be difficult to treat due to the constant pressure on the heel. Without proper rest and rehabilitation, bursitis may become a chronic problem in the heel. Heel cushions and prescription orthotics with extra foam in the heel can help to relieve the pressure but as with other types of foot bursitis, conservative treatment methods are recommended for a faster recovery and to prevent bursitis from becoming a life long nuisance. The most recognizable sign of foot bursitis is swelling caused by the enlargement of the bursa. This swelling is the build up of excess fluid in the bursa. When you suffer from bursitis you typically feel significant pain in the area of the inflamed bursa. If tendonitis is also present, the pain can radiate away from the bursa. Direct pressure on an inflamed bursa will increase the pain and should be avoided if possible. You may also experience weakness in tendons and muscles surrounding the bursa as the pain worsens and inflammation in the area spreads. As the bursa becomes more inflamed you will experience swelling, tenderness, warmth & redness. In severe cases the bursa will appear as a bump and is usually red, appearing extremely tender and painful. Swelling can cause difficulties moving your toes, foot, or ankle as the range of motion in the joints of your foot will be affected. Swelling may appear immediately following trauma, over a couple of hours, or up to 7-10 days after the event that caused the irritation. You will most probably be limping from the pain. It is important to treat bursitis in the early stages to reduce the symptoms, minimize damage and maintain motion and strength in your foot. Resting your foot, using proper cushioning and comfortable footwear, and reducing any activities that add pressure on your bursa will help to reduce your pain and bursitis inflammation. When at rest, the fluid in the bursa decreases, helping to relieve the pressure and pain. By treating your foot bursitis in the early stages with conservative treatment method, you are more likely to prevent long-term damage and chronic conditions from setting in. Bursitis is caused when an inflammation occurs and excess fluid builds up in one or several bursae. This build up of excess fluid can be caused by many different factors. The biggest factor is the bursa becoming inflamed due to strain or something (like a muscle, bone or tendon) rubbing against it too hard. High Risk - Pronation Abnormal pronation, or how much your foot rolls when you step, can cause the joints to move in ways they are not suppose to adding pressure on the bursae. This can cause irritation and inflammation and can start to cause pain in the bursae as well as in the surrounding tissue. Twisting your ankle the incorrect way or moving too quickly can cause the bursa to pinch resulting in an inflamed bursa sac as well. Wearing uncomfortable or improper footwear throughout the day or while playing sports also increase your chance of bursitis developing in your feet and toes. Wearing proper fitting shoes with cushioning will make your feet feel better and reduce your risk of bursitis. Overusing a joint - This can cause the bursa to become inflamed through being used too much. Prolonged stress on a bursa - This can cause the surrounding tissue to pinch the bursa, which can cause an inflammation. Activities/Sports (such as long walks or ice skating) - These can cause too much stress to be put on the bursae. Twisting a joint/Moving a joint too rapidly - This can pinch the bursa, resulting in inflammation. Alternately, bursitis can be caused by bacteria. In this case, it is known as septic bursitis. Septic bursitis is usually accompanied by a fever due to the infection in the bursa and must be treated with antibiotics. In any case, the first thing you should do if you think you have bursitis is to see your doctor for a diagnosis and advice on a treatment that is right for you. Do You Really Have Foot Bursitis? Visiting your doctor when you have foot, ankle or heel pain is always recommended, as there are many possible issues that can happen within the foot. Sometimes, one set of symptoms can result in multiple diagnoses. This condition that occurs at the back of the heel when you are suffering from achilles tendonitis & bursitis at the retrocalcaneal bursa. The retrocalcaneal bursa is a small fluid-filled sac at the back of the calcaneus (heel bone) that allows the Achilles tendon to slide smoothly over the heel bone. 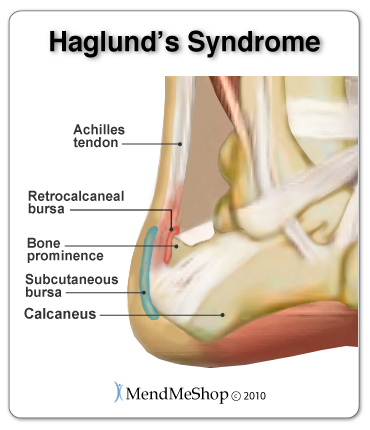 Haglund's Deformity is a painful, enlarged boney protrusion of the upper posterolateral calcaneus that is caused by calcification of the heel bone due to the inflammation of Haglund's Syndrome. Unfortunately, this boney protrusion causes further irritation to the retrocalcaneal bursa and achilles tendon due to excess compression of the Achilles tendon and bursa between the protrusion and the back of shoes or other footwear. This increased irritation then causes Haglund's Syndrome to become worse - thus completing a vicious cycle of 2 conditions causing each other to continuously worsen. Morton's neuroma will show symptoms of burning pain in the ball of the foot that may radiate into the toes. The pain generally intensifies with activity or wearing shoes. You sometimes feel that you are "walking on a marble," and you have persistent pain in the ball of your foot - you may even experience numbness in your toes. If you have Morton's Neuroma, you are experiencing a thickening of soft tissue that surrounds the digital nerve leading to the toes. This condition is caused by irritation, trauma or excessive pressure. Morton's neuroma most frequently develops between the third and fourth toes. 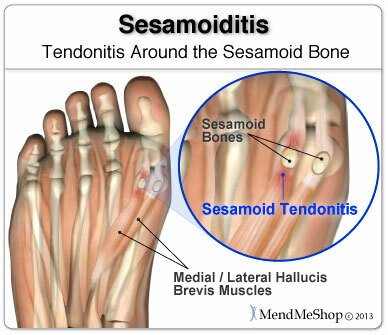 Sesamoiditis will occur when there is pain and inflammation in the sesamoid tendons that encapsulate the sesamoid bones. You may experience pain that will come and go in the ball of the foot just beneath your big toe joint. This pain will build-up over time rather than happen over-night. Swelling of the ball of the foot and bruising may or may not be present. You may notice range of motion changes and start having a hard time bending or straightening the big toe. Plantar Fasciitis pain associated with plantar fasciitis normally starts as a dull ache and then progresses to a sharp, knife-like pain or constant throbbing feeling that is worse when you put weight on your foot. The most tender areas tend to be in the center of your heel and along the inside and bottom of your foot towards your toes, where your heel and arch meet. It is worsened when you move your toes upward. Plantar Fasciitis is an inflammation of the Plantar Fascia, the tissue along the bottom of your foot that connects your heel bone to your toes, and supports the arch of your foot. How Do I Diagnose Foot Bursitis? When you are experiencing foot or heel pain and suspect you have bursitis, the best way to diagnose this condition is with a quick visit to the your doctor for a physical examination of your foot. Getting a proper diagnosis is important so you can treat your condition correctly. 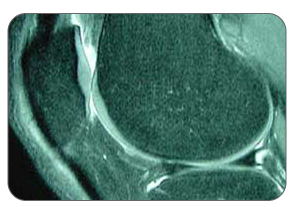 Untreated chronic inflammation of bursitis can lead to calcification of the bursa. Calcification of the bursa will mean that it will become more persistent and even more painful than before. 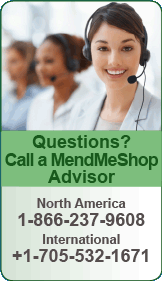 To begin with, your doctor will gather a medical history about you and your current condition and symptoms. He/she will ask about the amount pain you are having with your lower leg and foot. 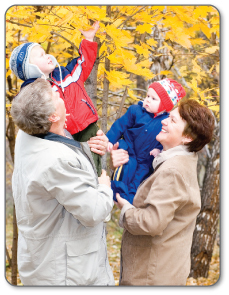 How long you have had your symptoms and if you are experiencing a range of motion loss or limp when walking/running. Details about what caused the pain in the foot, when it started, and whether or not you have ever had treatments for this or a similar condition in the past, are very helpful in assessing your injury. 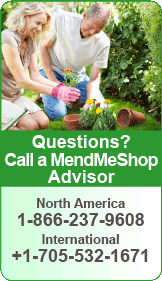 Your doctor may also consider any previous foot/knee injuries or joint stiffness that you may have had in the past. This will help the doctor to determine if you have a more complex injury in your foot and rule out any other foot injuries that may be present. Some bursae in the heel are close to the surface of the skin and are more susceptible to infection (caused by a cut or scrape) than most other bursae. An infected bursa is known as "septic" and is something to take seriously as it can quickly become life threatening. Your doctor may aspirate (use a needle) to remove fluid from the bursa to check for possible staphylococcus epidermis (or staphylococcus aureus) bacterial infection. Your doctor will be able to determine whether there is an infection or not by drawing a small sample of the bursa fluid with a needle. If it is determined that your bursitis is septic, you will be prescribed antibiotics to get rid of the infection. A physical examination will be performed to determine if you have any signs of Achilles Bursitis or other ankle injury. He/she will look and feel the soft tissue and bones in your ankles and feet to note any differences between the two of them. This will identify any abnormalities, such as swelling, bone deformities, atrophied muscles, redness and/or warmth on the skin. In many cases, the first sign that you have bursitis is swelling, typically accompanied with significant pain. If a soft tissue injury is suspected, an MRI will likely be done to view where and how much the damage is in your foot. An x-ray may be recommended to rule out a bone spur or other foreign body as the cause of your foot pain. Use T•Shellz Wrap® (Deep Tissue Therapy) Once Swelling is Down - After any inflammation and/or swelling has been reduced, use your own blood flow to maximize your rehabilitation, decrease recovery time, and boost overall long-term healing. Deep Tissue Therapy a potent home treatment medical device and can be very helpful in dealing chronic tendon, muscle & bursitis injuries or on-going pain & stiffness from atrophy in the foot, heel and ankle. Physical therapy and rehabilitative exercise under supervision of a physical therapist or doctor. The intent of this is to provide you with increased range of motion, pain relief and strengthening of the soft tissue surrounding swollen bursa in your foot. Caution: aggressive physical therapy can be harmful, such as aggressive stretching or massage. When dealing with an metacarpals, sesamoids, ankles or heels that have low range of motion, there is greater risk of injury to weak and damaged muscles and tendons of the joint (ie strain, tears, tendinitis, plantar fasciitis, etc). Stage 1: If the bursa injury is very recent - use a good quality cold pack and Arnica Pain Relief Cream. 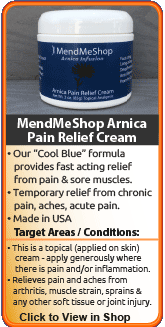 If you are experiencing pain and swelling in the very early stages of the injury (first 48 to 72 hours), the first step in a conservative treatment protocol would be to focus on reducing the discomfort by applying a quality cold pack to the injured foot along with a high quality pain relief cream such as our Arnica Infusion Cream. after any activity that stresses the foot in a moderate way. It is wise to quickly apply cold therapy to not only reduce the pain, but to also minimize tissue damage that may have occurred during the prior event. If you have a job that requires you to place some demands on your foot. If that is the case, use cold therapy immediately following work and if the opportunity allows - use it for 15 to 20 minutes during lunch or another break time. If you are in a post-operative situation where cold compression would be utilized heavily for at least the first few weeks following the procedure. Similarly, if you are scheduled for upcoming surgery, then your doctor or surgeon might recommend undertaking cold therapy before the surgery. Even though the concept is simple, improving blood flow to injured soft tissue in the shoulder can be difficult. Traditional methods require your joint to move to promote blood flow (exercise), but that same motion that promotes blood flow can at times lead to making your pain and condition worse - exacerbating your bursitis. Have you re-injured your foot by returning to work too quickly? How many times in the past have you aggravated your foot just trying to perform basic tasks around the home? 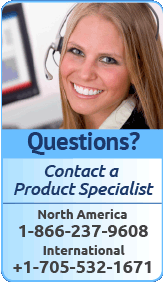 Is your debilitated foot preventing you from work or activities you love to do? The real challenge is how do you promote blood flow to the bursa in the foot without causing further injury? Keep in mind that the foot is involved pretty much any physical movement made if we are on our feet. 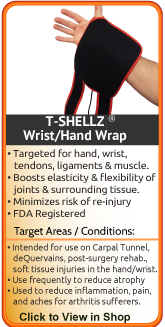 The best option we came across in our research to accomplish true healing of bursitis (and other soft tissue injuries of the foot) is the T•Shellz Wrap®. Use of this FDA registered medical device results in a dramatic increase in blood flow to injured soft tissue located deep within the body - all in a non-invasive manner. The T•Shellz Wrap® is based on the scientifically validated principal of Electromagnetic energy as we discussed previously. This form of treatment is safe and effective as shown in numerous studies which can be referenced through the National Library of Medicine. Professional athletes and those in the medical field have been users of the technology for decades - it really hasn't been until recently that companies like ours introduced the treatment devices to the home user. Using the T•Shellz Wrap® is truly a unique experience. Within moments of applying a treatment to your foot, you can feel the healing sensation due to the increase in blood flow deep within the foot. During a treatment, and for quite some time after you finish, the treated area will feel relaxed and less painful. It's a very soothing sensation and extremely effective. If you have bursitis, tendinitis or any other injured soft tissue in your foot, then deep tissue heat from the use of a T•Shellz Wrap® will enhance blood flow (& thereby boost the body's healing response), increase flexibility of soft tissue & increase the length of soft tissue, thus reducing your risk of re-injury while healing at an advanced rate. 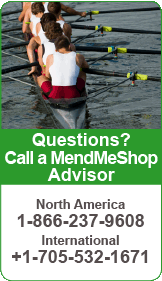 If you are dealing with conditions affecting your range of motion such as tendinosis, tenosynovitis, bursitis, or even arthritis. If you have a chronic foot condition that has lasted for years- this device will help start the rebuilding process and help strengthen the surrounding and supporting tissues. Many of our past clients had suffered for years, then were completely amazed at the results only after a few months of treatments. If you are still working with an injured foot, the T•Shellz Wrap® will help relax injured soft tissue prior to work and after a day at the job. If you are suffering from bursitis in your foot and want to treat the major source of it (secondary damage to the muscle and tendon surrounding the bursa sac). Through overuse or degenerative changes in the foot, the muscle and tendons surrounding the bursa sacs will tighten and constrict. When they do, they place pressure on the bursa, causing it to become irritated. Applying a soothing and deep penetrating heat energy to the foot relaxes soft tissue, taking pressure off the bursa. If you are experiencing atrophy in your foot and want to reduce the chance of re-injury while stretching - this is a perfect treatment to use every time before you stretch. T•Shellz Wraps contain a unique Carbon Fiber Energy Pad which is flexible and will shape to conform to your body. This Energy Pad emits a uniform wave of perfectly safe electromagnetic energy over its entire surface. This energy travels deep inside to the soft tissue in your foot and arm, stimulating blood flow your own body needs to heal your injury. It is the electromagnetic energy that is crucial to the healing process. 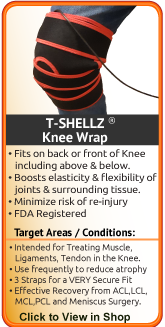 The T•Shellz Wrap® is an FDA Registered Medical Device and is suitable for use in therapeutic clinics and FROM HOME. 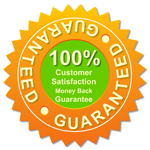 It is completely safe for people and patients to use for themselves. Have you ever wondered by an athlete can return to activity after 3 or 4 weeks following a soft tissue foot injury - while your average person takes much longer to return back to normal? The secret isn't really that much of a secret - it involves consistent treatments (meaning multiple times a day) using a diathermy treatment like the T•Shellz Wrap® to stimulate blood flow to injured soft tissue. Most athletes have the luxury and access to use in-house therapy facilities with treatment options such as these many times per day. Which T•Shellz Wrap® Should I Get? The T•Shellz Wrap® you choose will depend on what area of the foot you want to treat. If you want to treat under or above the ball of the foot, the toes, the top of the foot or around the ankle bones, then you will need the Sesamoid T•Shellz Wrap®. Click here to view it on our web shop. If you want to treat the bottom of your heel and the plantar fascia, then we recommend the Plantar T•Shellz Wrap®. Click here to view it on our web shop. 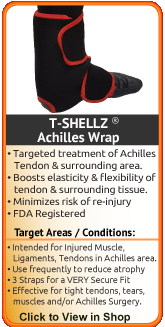 If you want to treat the back of the heel and achilles tendon, we recommend the Achilles T•Shellz Wrap®. Click here to view it on our web shop. The most common question we receive from individuals prior to purchasing is - how many times a day should I be using my foot wrap and when should I be using them? While treatment plans will differ for each individual and their specific injury, there are general guidelines that should be adhered to. Since you are reading this, you probably know that serious foot bursa and tendon injuries do not just disappear. Over time, they usually wreak havoc on your heel and knees due to lack of movement and over-compensation. It will also wreak havoc on your opposite foot due to overcompensation. Recovery takes a longer time for such chronic (long term) injuries, but proper healing is essential to regain strength and get you back to the activities you enjoy. 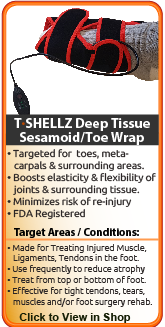 A Deep Tissue Therapeutic T•Shellz Wrap® to generate deep heat in the area of your injured soft tissue. Your body responds to this deep heat by increasing blood circulation to this same area, thus helping accelerate the healing of injured soft tissue. An Exercise & Stretching Plan to prevent muscle atrophy & shortened tendons. A proper plan will increase elasticity and strengthen the muscles of the foot, ankle, lower leg and knee of the injured foot. Conservative treatment tools just like these have been used successfully by thousands of bursitis and tendinitis injury sufferers - just like you. Doctors and Surgeons are always improving the techniques used in surgery, and results from surgery now are much more positive than they were in the past. However, all surgeries introduce scar tissue, and recovery from bursectomy surgery can be less than ideal and take longer than anticipated. If you are unsure about whether you need surgery for your bursitis, you may want to read through our "Do I Need Surgery Page, here. We believe the use of T•Shellz Wraps for effective treatment of soft tissue foot injuries (bursitis, plantar fasciitis, tendinitis, foot strain, ankle sprain) is one of the most under-utilized home treatment options available on the market today. We have thousands of customers that have tried many options out there and have been amazed at how effective and fast the TShellz Wrap treatment can heal soft tissue injuries. Deep Heat from the wrap will trigger increased blood flow in your foot. Increased blood flow will accelerated the healing rate of soft tissue. Ongoing treatments to enhance circulation will soothe, relax and promote healing of your damaged foot bursae, muscles and tendons. T•Shellz treatments will also allow your soft tissue to extend further due to the deep warming sensation created by the enhanced circulation to the treatment area. The more extensible your tissues are, the less likely they are to strain or sprain. 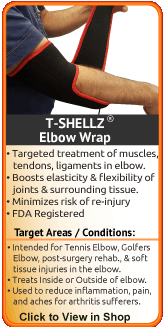 The T•Shellz Wrap® is a highly effective therapy tool for people suffering from soft tissue damage in the lower bicep tendon/muscle, forearm tendons/muscles, elbow bursitis or other soft tissue damage in the elbow area. (muscle tears, spasm, tendon tears, strains, tendonitis, tendinopathy, tendinosis, impingements, pain associated with trigger points, scar tissue, and arthritis). It may seem hard to believe, but our TShellz Wrap home therapy products will assist you in recovering from the bursitis in your foot by maximizing blood flow where it's needed most and reducing your swelling and inflammation induced pain. Continue the healing process by resting your foot. Limit the activities that may be aggravate your foot. Without proper rest and limitation on activities, being active as if your foot is healthy can lead to re-injury and/or a worsening of the existing injury. To get back to doing the things you love you need to give your body proper care and attention. If you want to avoid re-injury, manage pain and increase circulation for lifelong health benefits, a Cold Compress or Ice Pack and a T•Shellz Wrap® will provide the results you are looking for. Why spend time in pain, off from work, and missing out on your active lifestyle when you can be proactive about your injury and the health of your body? 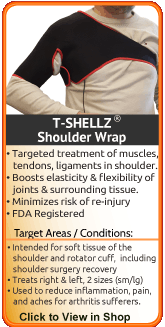 Talk to your doctor about incorporating the T•Shellz Wrap® into your home recovery regimen.